Many articles and webpages have been devoted to the subject of who to invite to your wedding and how to choose who gets an invite and who doesn’t. What is less covered and more difficult is how to deal with those guests you have to invite but are hard to handle. New partners of your divorced mother or father, aunts who have a tendency to upset people, uncles who get drunk and insist on a dance. Gatecrashers: A major advantage of having your wedding here in Spain is that you are far, far less likely to get uninvited “gatecrasher” guests at your wedding. If, however a friend or relative turns up with an unexpected plus one this can throw the numbers out and make you feel flustered. Try not to worry however, if they’ve let you know a few days in advance, advise your wedding planner by phone and text as well as email to ensure they know and can order an extra meal. Ask them to check other items that the plus one may also need such as a wedding favour or another chair if you are having Chiavari chairs. If the additional guest really has just come on the day, be gracious, don’t let it spoil your wedding. Simply ask your planner for help accommodating them and for a simple snack if a full meal isn’t possible at that point. Your original guest and their plus one will appreciate the effort and thoughtfulness. Difficult parents: There is a well known saying “forewarned is forearmed”. Put simply this means prior knowledge of possible dangers or problems give one a tactical advantage. This is certainly true when it comes to diffusing difficult situations and guests, especially parents who have remarried or now have different partners. If you know that you or your partner’s parents are going to cause problems have a frank conversation with them about it beforehand and give them a choice. Eg: I’d love to have you both at the wedding but you must promise not to fight or we’ll have to ask you to leave. Speak to your wedding planner and the hotel to ask for someone to be on hand to eject or take aside fighting or shouting guests so your day isn’t spoilt if things do kick off. Refusal to be in photos: Some family members can take a feud so far that they will refuse to be in a group photo with another family member or members. If this is the case at your wedding you have a right to put your foot down. Speak to your guest or ask your planner to do so and explain that they are there to support you not make things more difficult. If you know there will be an issue tackle them prior to the day and remind them they’re expected to dress appropriately, be in the photos they’re asked to be in, and generally behave well. Ultimately it’s your day and a celebration of your union. Don’t let one or two uncooperative people spoil it but take courage and tackle any potentially difficult situations and guests beforehand to ensure your perfect day really is just that. 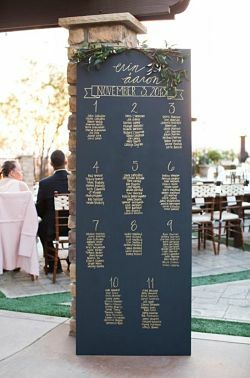 Chalk boards are set to be huge for 2015 and are a fantastic way of adding a personal touch to your Big Day in a simple inexpensive manner. Here we look at five ways you can harness this trend for your wedding day. These work especially well here in Spain to tie in to a more informal, outdoor theme or can add a more artisan touch to a formal wedding. 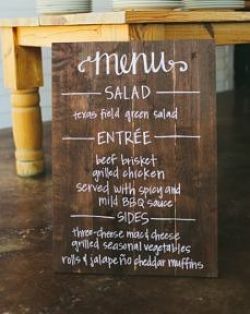 Ask us if you’d like to rent a chalk board (or two!) 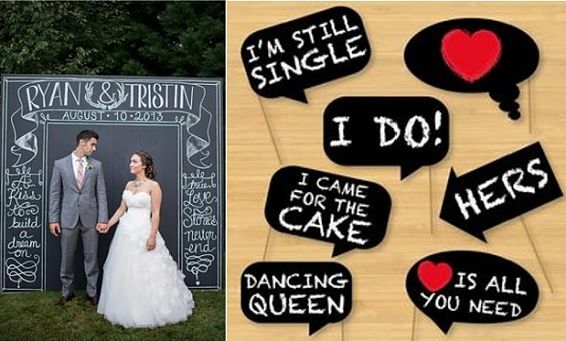 and send us your own ideas too as we’d love to see more ways you can use these brilliant wedding props! Amid the big decisions about your wedding day, who is going to sit where, can seem just one more detail among many. In the busy few weeks before your Big Day creating a plan for all guests can seem time consuming and overly formal. 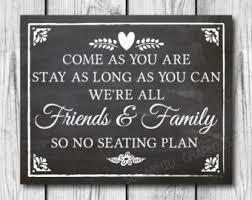 Because of this many couples are opting for no seating plan or just a top table list and a request for guests to sit where they wish. 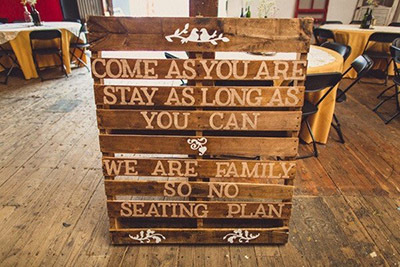 If your wedding is a small and/or simple affair and both your families get on well this can add to the atmosphere and fun of your reception. 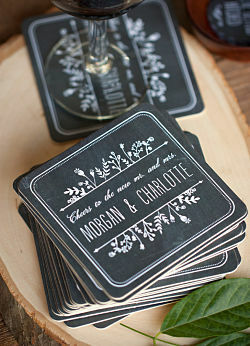 However it is not always the simplest option for all weddings. Even if you favour a relaxed approach therefore it can be worth thinking things through before doing away with your plan. If nothing else the one thing you should definitely do is to speak to your planner about the regulations at your venue. Check the minimum and maximum number of guests that can be seated per table, what shape the tables will be and if there is any restriction on the number of tables you can have for your guests numbers. This will not only help you make your final decision if you want a set table plan or not but also save you hours remaking the plan if you made it before taking these into account! More relaxed feel to your wedding meal as family and friends chose where to sit. Not permitted at some venues if you are offering a choice of main courses. Potential problems if you have family or friends who do not get on. No say over who is nearest to the top table – ie close family members may end up at the back! Essential at many venues if you are offering a choice of starters and/or main meals. More work for you in making it. It's your day and your decision but make sure you think it through! As smart phones, selfies, social media and the internet continue to dominate our lives one of the big issues set to dominate weddings, this year and next, is wedding photos. If you are planning to marry in Spain or anywhere else this year there are some serious issues to consider surrounding your wedding photos therefore even if you don't own a camera. The chances are, that pretty much every guest you invite (even older family members) has a smartphone with a camera which can access the internet. Before you know it images of you and your beloved can be all over social media and you have little control over their portrayal. Some brides report images of them in their dresses on social networks before they’ve even walked down the aisle, leaving them feeling out of control about the way their day is being portrayed…. 1) Ask nicely. The old fashioned but simple way to retain some say over your wedding photos is to simply ask guests prior to the wedding to send photos to you before sharing. You don’t have to sound mean about this, but simply request that wedding photos are sent to you so you can not only see them before they go viral but also so you can add them to the photos of the day that you have. Friends and family may have taken some fun and fantastic shots and these can be a great addition to the more professional photos from your photographer. 2) Recommend sites/software. Many of your friends and family may use internet sites such as Instagram (an online photo-sharing and social networking service). 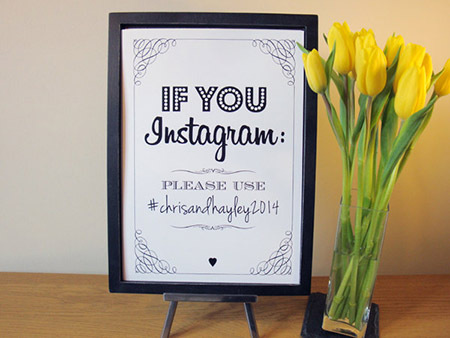 If they do you, pre-empt the image free for all by setting up a new profile on Instagram solely for your wedding and a hashtag for it which you send to all guests... A dedicated hashtag will ensure all of your wedding images appear in the one place and are easy to find and let guests know they are welcome to take photos and share them this way. 3) Photo booth /props. Many photographers offer a professional photo booth service as an added extra. If you don’t want a full photo booth however we also offer a Photo booth props service including a picture frame, wigs, silly glasses and other props. These can be used by guests to take photos with their cameras or phones making it a fantastic and inexpensive way to get some fun photos of friends and family to add to the wedding day story! With all the adverts and promotions over the last couple of weeks it can be hard to ignore Valentine's day. Traditionally the day when you could declare your love anonymously to another via a simple card it has become a chance for companies to promote all sorts of things on the back of the occasion. The chances are however that if you are planning a wedding either here in Spain or elsewhere you have already found your other half and are not fooled by the Valentines day sales patter. What can be vital as as the planning heats up and work and life keep you busy is not something you can buy but instead some time with your partner. In this respect Valentines day can be a great reminder to spend quality time together talking about the stuff which matters most to you both. Research shows that couples planning a wedding are often simultaneously moving house, planning children, changing jobs or in the midst of other big and time consuming life events. So this Valentine's day triumph in romance and wedding planning spending some time together looking at special touches for the day together. This is a win win plan as you can use the money you save in Valentines towards incredible wedding items. Tuno guitarists make a lasting impression and are not much more than an elegant dinner for two. Fireworks are a beautiful way to add wow to your wedding for much the same price as a romantic weekend away! Alternatively an extra special wine or sorbet course are a small supplement on your menu choice. Whatever you decide Valentine's day can give you a chance to spend time together. Share a bottle of (Spanish!) wine and talk about wedding plans... Amid a busy schedule it can be the best gift of all.